Since our founding in 1895, Richmond Dental and Medical has been a leading supplier of dental products to dentists, hygienists, and dental assistants caring for patients worldwide. More than a generation ago, Richmond Dental and Medical took a leadership role in medical and dental sponges for a variety of clinical applications, from simple cleanings to complex surgeries. In the dental clinic, dental sponges may be applied post-tooth extraction, as well as for oral surgeries and periodontal procedures. Much like their dental counterparts, medical sponges see use for cleaning and disinfecting instruments, wiping down surfaces, in addition to removing fluids from wound and surgical sites. Dental and medical sponges come in two basic fabric types, nonwoven and woven. Each type tends to be optimal for different applications in the clinic. Richmond Dental and Medical nonwoven sponges are processed through hydroentanglement. During fiber entanglement, fibers come together via mechanical bonding, which provides fabric strength. Fabrics using high-pressure water jets to entangle a web of fibers are made without binders. A forming belt supports the fiber web as it passes under the water jets. The shape of the belt produces the perforations, a key part of the process that results in the fabric taking on an open gauze shape. The high energy of the water removes any dust or short fibers, which explains why hydroentangled nonwoven fabrics have lint-free properties. In the case of cotton sponges, we use Barnhardt Purified Cotton™ eliminating the need for further fabric purification. Gauze is woven on a loom that joins two sets of yarns by weaving one set through the other. In this process, the two sets of yarns are perpendicular to each other. One set, called the warp, runs the length of the fabric. The loom raises some of the warp yarns up and some down, creating a shed. The fill or weft yarn, when placed in the shed perpendicular to the warp yarns, interlaces with the warp yarn as the shed closes. In gauze fabrics, there are only a few yarns of warp and fill per inch of fabric. This dynamic creates the openings or spaces between the yarns in the fabric. At the end of the process, woven gauze is purified to remove the natural oils, waxes, and color, making the fabric absorbent and white. The types of fibers used provides another point of variation between woven and nonwoven medical and dental sponges. While woven sponges only utilize cotton, nonwoven varieties derived from the hydroentanglement process may be comprised entirely of cotton, or blends of polyester and rayon. While both cotton and rayon will biodegrade, polyester will not. Cotton fibers, especially in woven varieties, are preferred for dealing with greater wetness, since cotton fibers get stronger as they get wetter. Polyester, on the other hand, is a non-absorbent fiber; thus, its strength doesn’t change when wet. Polyester is used in combination with rayon, typically, since the two fibers complement each other--polyester is strong, while rayon is absorbent. One of the benefits of nonwoven sponges is that they are lint-free, while woven fabrics can be non-linting and may have fiber. Nonwoven fabrics have more space between the fibers; these spaces act as reservoirs to store liquids, thus having a higher absorbency capacity. Because the fibers in woven fabrics are tightly spun into yarn, there is less space between the fibers for liquids to be held. Naturally, the more layers of fabric in a sponge (also known as ply), the higher the capacity for absorbency. 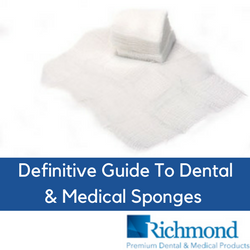 At Richmond Dental and Medical, we pride ourselves on assisting dental and medical clinicians in selecting the right sponges for their respective practices, through our experienced, responsive distributor network and a host of resources here. Our downloadable sponge guide is a great resource for sponge selection, whether you need woven sponges, nonwoven sponges, or both. Distributors can take advantage of our online portal for educational materials as well. If you’d rather have a conversation to walk through your best options, we are happy to oblige. Please call us today at 855-841-0743.